Standing just 700 metres away from the Ruby Park crossing, Bengal NRI Complex in association with the Government of West Bengal, presents Urbana, a premium residential complex boasting of Kolkata's tallest towers. The seven G+40 and G+45 earthquake resistant structures are part of the premium township that will also accommodate luxury bungalows in the near future. 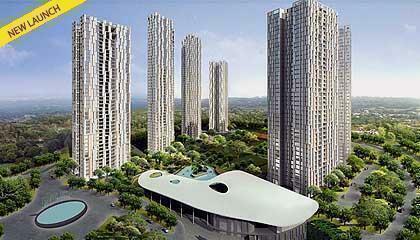 Units on offer are 3 and 4 BHK spacious apartments that are three sides open. All the apartments are with premium specifications like laminated wooden flooring in bedrooms, Italian marble flooring in some living rooms and VRF air conditioning. All apartments come with servant quarters. Urbana presents a host of lifestyle amenities which includes the 80,000 sq. ft. clubhouse, one of the largest around. It houses a temperature controlled lap pool and an Olympic size infinity pool, besides steam and sauna facilities. Indoor and outdoor games facilities include cricket pitches and sports fields. In addition, a 10.5-acre landscaped park, children's play area, and palm court promise residents the best of living. Located in Anandapur, Urbana enjoys proximity to many important landmarks and facilities. While the Kolkata International School and the Delhi Public School are well within 2 km radius, medical facilities like Ruby and Desun hospitals are next door, while Peerless Hospital is less than 5 kilometres away. Important transit points like Gariahat and Park Circus are easily accessible.